This airfield, located near 3 kms from Uberaba city was established in 1934, when started the first flights of a national airline -VASP- between that part of Minas Gerais state and the city of São Paulo. Then was known as "Uberaba airfield". In the middle of the 50's decade was inaugurated the passenger terminal, and by 1958 after the local government (Prefeitura Municipal) made a cesion of the property of the airfield to the Aeronautics Ministry, it was elevated to the actual condition of Airport, being renamed as Santos Dumont Airport. In 1980 was finally transferred to Infraero which assumed his management with the actual name of Uberaba Airport. It counts with a paved runway neat 1.8 km length and 45 meters wide with a flow of 130.000 passengers/year. In 1982 the site was chosen to perform there a stratospheric balloon launch campaign in two steps: the first in April when were launched two balloons and the second in October and November with other two. The launch operations were a cooperative effort between staff of the National Scientific Balloon Facility from US along with their local partners of INPE's Balloon launch Sector (Setor de Lançamento de Balões). Since then, the site was not used again fot this activities. 4/11/1982 --- PULSAR In Andradina - Sao Paulo. 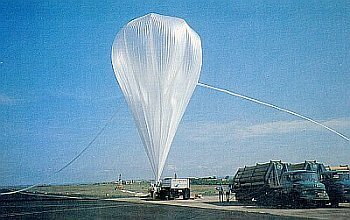 11/25/1982 12:08 utc 4 h HEXE (High Energy X-Ray Experiment) Aborted mission due to a hole in the balloon. Payload recovered undamaged.